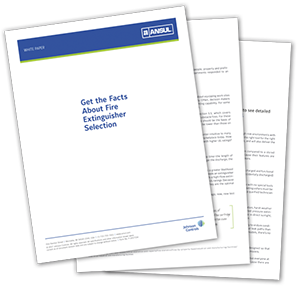 What Is the Right Fire Extinguisher for Your High-Risk Environment? This one inch, propane gas line fire represents a typical industrial gas line break that found an ignition source. It is important to note, you should always attempt to extinguish this type of fire by shutting off the flow of fuel. However, if the valve or people are involved in the fire, there is no choice but to extinguish the fire. As you can see in the videos, it takes a high flow extinguisher delivering over one pound per second of dry chemical to extinguish this fire. The RED LINE high flow extinguisher on the left makes quick work of the fire with agent remaining to extinguish again if necessary, while the stored pressure extinguisher on the right is unable to extinguish the fire.